On the quiet North End of the Street lies a vibrant storefront polished to its finest where you enter a world of brooms, bludgers, snitches and much more. Displayed at the window of the Quality Quidditch Supplies shop is the latest released broom. As you enter in the shelves and displays are the first thing you notice neatly stacked with other brooms, team posters, and robes galore. Between the side walls there are various shelves that are filled with various Quidditch supplies and goods. Following the displays of brooms and the like, towards the back you see another section of displays, not of brooms, but the side walls of the shop are neatly stacked with frames, gobstones, and matching merchandise for support. Feel free to stroll along and find what you need to aid you in your game play. Lastly, the back wall displays books and other reading materials, all to do with Gobstones and Quodpot of course. Towards the back you see another section of displays with little knick-knacks and toys perfect for all ages. Only our most privileged customers are permitted to enter the back room of the shop. Here we hold unique items and remaining stock of items that aren't able to fit on the displays or are in need of refurbishing. At the very back is a door where the shopkeeper does his admin work. Once you’ve found and decided on the goods you wish to purchase, you may bring them along your way towards the counter found right in the center towards the back of the shop. The shopkeeper may seem busy but that won't stop him from assisting anyone. This shop is STAFFED by Brad Davidson (Charely Potter). Today was an especially great day. Uncle Aegis had promised he would take him out to go practice Keeping to help him improve and better his skills as a Keeper for Next year when he tries out for the Ravenclaw Quidditch Team again. It was agreed that his Uncle would purchase him his own Keeper gear so he didn't have to use the less than steller Hogwarts stuff the school provided them. Mark browsed through the aisles picking up and checking the sizes of each of the Keeper gloves, looked at all the different kinds of Quidditch Goggles, and though a bit hesitant about who else might have tried on the helmets put them on his head to check the sizes and how they felt. What he really wanted though was to look at the Brooms. Mark wanted his own Broom for School next term, and since he was much more serious about playing Quidditch than Xaria was maybe he could convince Uncle Aegis to purchase him one of the Really Cool brooms here. Naturally Quality Quidditch Supplies was on Nettie's list of places to visit today. She'd broken her Quidditch goggles in the final game last term - she'd taken a tumble going for the snitch, and not only had she NOT caught it, but she'd busted the right eye out of her goggles. Le sigh. As she browsed, she turned the corner and saw her fellow teammate and Eagle Mark browsing the shelves. She grinned and hurried up to him. "Hey Mark!" she exclaimed, hopefully not giving him TOO much of a heart attack as she ran up behind him. It was that time of the year again where the students would be wanting to get the best brooms possible and the shop never ceased to provide it. Especially if you asked Brad the long time shopkeeper who was at the counter, fixing up some things in the back. He had perfect view of any customers arriving in so he kept watch while multi-tasking. If they needed extra help he was here if not, then that was just as fine. It was a safe haven for fellow Quidditch & other sports fans. Patrick walked into the shop, knowing full well that he needed to pick up another broom servicing kit. He tried to keep one or two just in case someone forgot their own during the quidditch season. He also needed to pick up a few things for himself, hoping that he would manage to keep the title of Quidditch Cup winner again for Slytherin. Scooting around the shop he looked at some of the other items in the shop that his brothers had mentioned he should pick up some things for when they came out to his grandparents to visit. He grabbed the Quod solution so they could play some quodpot in the back of the field. He had the note from his mother saying it was okay for him to buy it. She had to go into the office and he did not want to wait for her to be done. He glanced around trying to see what else he might need for this visit. No, Maeve was NOT here to shop, just in case anyone got any ideas because S.O.R.E. had definitely not turned her into a quidditch player overnight. She was here looking for persons because where ELSE would she find a quidditch player but the supply shop?? The persons being Anna or Emma or Chase because it felt like it had been foreverrrr since she'd seen them. How hard was it track them down? Surely they didn't just DISAPPEAR, right?? She'd seen them at the feast, but where were they NOW? Yes, Anna and Emma had their summer league, but that didn't excuse them from making time for HER, right?? Her FAVOURITE Diagon Alley shop! Well, her FAVOURITE shop ALTOGETHER, actually. Quality Quidditch Supplies was always the first and last shop Anna visited when she went to Diagon Alley, and sometimes she went there in between buying other stuff too. So there she WAS again, OBVIOUSLY. Only this time a very atypical sight to be seen in that shop was the first thing Anna saw. "Maeve!" She exclaimed, chuckling as she approached her friend. "Finally decided to come to the Dark Side, have you!?" The girl gave the blonde her signature cheeky grin, then she realised she sounded just like Matt, so she pulled a somewhat disgusted face. "I mean, you've decided to JOIN us." Merlin, was she already being brainwashed again by spending the summer back home? Noooooo! The blond jumped back from where was she was standing looking over a magical microphone- which she dropped out of being startled and made a loud echoing sound "Eep!!! Anna!!! You're alive!" Maeve squealed, [b]"... sorry i mean of course i just feel like I haven't seen you and nooo I'm trying out for quidditch and honestly I don't care if I never run again either"[/s] Seriously after those last few months of struggling through S.O.R.E. And then being late for classes. Only good thing is she was weirdly getting some definition in her thighs but nooo she far preferred sleeping that extra hour! That would be disbanded now that the authoritarian regime was out, right? "How are you??? Have you seen any of other roommates? Or Chase? Or Kamryn? I mean i guess Emma obviously, but like i feel like I haven't seen anyone and i was feeling all kinds of lonely and ohhh!! I got you something from my trip!" Okay so she had disappeared for two weeks to another country. "I have pictures too but i can wait to share them when we get back!" or now, whatever. She was just glad to see Anna. And she should probably pick up that microphone and make sure it wasn't dented or anything. Odaline had been separated from her sister Ingrid in the crowds passing through the street and had ended up being shoved through a door into the closest shop. With a stumble and an involuntary shriek, she stood surrounded by.....cleaning materials. Cleaning materials with shiny handles and that didn't look like they did very good work. Who wanted a broom that would shed if you swept a pile of rocks out of the way? Clearly a lot of people because these things were expensive. Odaline found herself touching the prices and muttering about a waste. 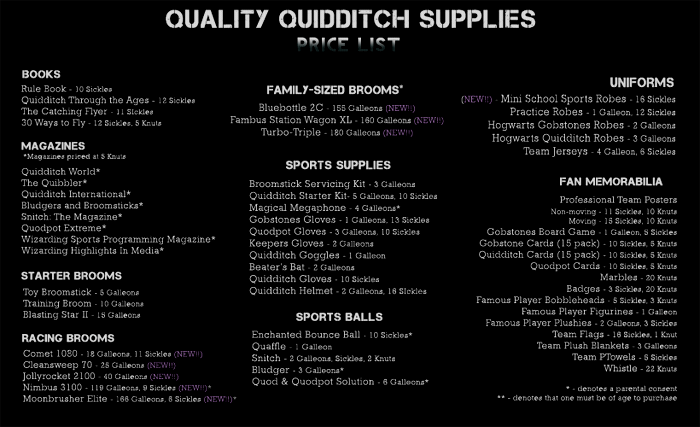 The quidditch shop. This place was her second favourite place. The first was obviously the quidditch pitch. But the shop was a close second. She was excited to be here, and see all the new things that were there. For once, she didn't need anything new, but it was always good to see what they had in stock. The magazines were good to look at too. Lili was also pretty interested to have a look at the brooms. She didn't need a new broom, but she was hoping maybe her Mama might buy her one if she made Captain. So it was always good to have a look, and know what her options were. So that was her plan today. Later she'd probably get some ice cream, but for now she was going to spend some time in her second favourite place in the world. Flying was something that Farah was medicore in. Let's be real... there was a lot that Farah was medicore in. She wasn't really brilliant at anything. She could pick loads o her friends that were destined to be certain things. Not her. She didnt have that spark for anything. She used to have a spark to see the best in everyone, but that spark was dimished right now. Would it come back? Who knew. But right now, she was looking at the brooms, debating on getting one. She'd always wanted one... she just never really asked her dad for one because she thought that they weren't allowed to spend a lot of money. That was until her father passed and she was the sole person to recieve what he left behind. She didnt really want it either, but that was something they could get into later. Right now.. she was eyeng a rather sharp broom that looked faster than the speed of light. She heard footsteps and peered over at a girl coming over to view. She didnt speak yet... Quite unlike her old self who would be busting to talk to the girl. But alas, she wasnt who she used to be. She did offer a slight smile though. Hi. Siobhán had been advised to stay near the entrance of the Quidditch shop while her dad had gone off to get new goggles for himself. She was pretty sure she’d NEVER seen the shop so busy as today. So. Many. People. And most of them were a lot taller than her. Which, frankly, didn’t intimidate her one bit. Ducking under someone’s elbow, she was about to head further into the shop (she’d just find her dad in a few minutes, couldn’t be that hard right?) when she both heard and felt someone come stumbling into the shop. Oooh someone around her age! This girl was a lot more interesting now than anything that this shop had to offer which was why she quickly slipped in between two adults and moved to stand next to her. If there was anything that Liliane knew it was brooms. She'd grown up with brooms and quidditch. That was what she got for having a professional quidditch player as a mother. She really did not mind though. Lili loved quidditch. And she knew brooms. It helped, because she knew that she wanted to get the very best broom. That was if she got a new broom. She wasn't just going to beg for one though. The broom she had now was pretty good. She just wanted to get a new one when she could. To be the very best she had to have the best broom so that she could keep up with the competition. That was why she was here, so she could look at the latest models, and have her new broom picked out in case she got to have one. She glanced to the side, smiling at the girl who was there. She kind of recognised her, but she had been away from Hogwarts for a year so she had probably forgotten some people. "Buying a new broom?" She asked, with a smile. Polite conversation was how you made friends right? Farah played with the ring on her finger that she recieved from her dad after he passed. It was a turquioise stone with gold wrapping and it was beautiful and small. He'd always told her that he would give it to her when she was older because it reminded him of her. Now she had it in her possesion.... before the time that she was supposed to get it. She continued to eye the brooms absent mindedly as she played with her ring. Hearing the girls voice, she snapped herself out of her thoughts. "[b]Huh? What? [/]b" She asked, not sure what the girl had said because she wasnt payng attention. "Sorry, the brooms.. they are distracting." She tried offering an explanation even if it wasnt truthful. No part of Odaline's thoughts had ever been about buying extortionately priced brooms, but she was thinking about it now. What was the purpose? Did they clean for you? Put something exceptional into your floor? Odaline was intrigued, however.. she didn't want to be. Her parents would be disappointed that she had an interest outside of their personal curriculum. The girls eyes widened as someone stood beside her, the urge rising in the pit of her stomach to pull a display on top of her new companion and escape back out of the door. Oh. Was she not supposed to talk to her? It looked like the girl hadn't really been listening to her. So maybe she hadn't wanted anyone to talk to her. But then again the other girl had smiled at her, and Lili had taken that as an invitation to start a conversation. Maybe she had been wrong with how she had read that? But oh well. A conversation was started now, and that was good. Maybe Lili could make a new friend. She liked friends, and felt more confident about making them now. The last year had been really good for her self-esteem and her confidence. It was a good feeling. That was okay too. Siobhán didn't mind being the only one who talked. "You can't decide? I don't know if these are the best ones. My dad keeps trying to teach me but...so how old are you? Are you going to Hogwarts? Do you know what it's like?" Of course she'd heard aaaaaallll the stories from her dad and her grandparents but somehow it just wasn't the same as hearing them from a fellow student. Hopefully this girl had some stories to tell. Farah wasnt, well.. she hadnt been up to making friends in the last few months. Not since her father died. In fact, she'd pushed away most of her friends and her boyfriend. Luckily, some of her friends were as hard headed as her and gave her the space that she needed without not stopping being friends. Her boyfriend though, she'd broke up with him.... Something she dared not think about lately. Faah looked back up at the brooms and then at her, dropping her necklace as it laid back against her chest. "I think I like this one." She said, reaching out to touch the latest model. "I only fly for recreation though. Do you think i need this one?" Though... she had promised cam that she would try out for Quidditch this year. She had a natural talent for it but wasnt necassarily passionate about it. After the doors close for usual business, Quality Quidditch Supplies lays home to your after-dark date. After you are ushered out back, you'll find that what is normally the back room full of stock now mimics a miniature quidditch pitch for your special evening. Take a pick of the newest brooms available and take flight with your date, together or in competition. Every ball and bat in this room is charmed not to cause harm or hurt, so go ahead and show off your skills with a beaters bat, scoring in the hoops that move by themselves or maybe you'll take a death-defying sprint toward the ground for a snitch. A snitch, that when caught will (Surprise!) present you with a voucher for a restaurant of your choice. Planning a second date already? When there was a news about the matchmaking, his newly married sister was so enthusiast to sign his up because according to Ashley Chang nee Hernandez, he seemed pretty lonely. Heh, just because he's going to be 40 and still single at the moment, it didn't mean that he was lonely. Jordan totally enjoyed what he had been doing with the job at ministry, living with three dogs and started investing on an abraxan sanctuary that his former classmate in Salem WU had built. But fine, this was just for fun after all. No strings attached or whatever. Dressing casually like he usually did, he arrived at the quidditch supply shop. Seemed like he was here early. Now who was his unlucky date? It wasn't the date that Edmund would have picked for himself, but he couldn't help but feel a bit nervous. He had been on the road a bit too much with the band and he just wanted to have some fun and where else could you get some laid back fun but the quidditch store. Ed tried to figure out when the last time he had stepped into a quidditch store or even bought a broom. He probably was a teenager. Looking at his reflection in a door he fixed his hair and was glad he went for the more casual look before heading in the back where he was directed. Seeing another man standing there Ed had a bit of nervous jump up before stepping forward. "Hello, you must be my date." A grin crossed his lips before he reached out his hand, "I'm Edmund, but please call me Ed." Seeing another man coming in, he couldn't help but grinned at him. First impression? This man seemed quite confident about himself, and that was good. He appreciated confident person. "Hello, Ed." Jordan gave him a friendly greeting. "Yes, I'm Jordan and it looks like I am your date." Because nobody else was here but both of them. Perhaps they should enter this shop and find out what they were going to do but pretty sure it involved Quidditch. "Funny that I'm not really a big quidditch fan, and somehow they gave us a quidditch-related date." The 39 year-old chuckled. Well, he enjoyed flying but not on a broomstick. Flying with winged horse is way more fun and exhilarating. "How about yourself?" Edmund couldn't help but smile at the introduction Jordan gave. He was quite pleased with who they selected as his date. "It is a pleasure to meet you Jordan, I am indeed your date. I hope I didn't disappoint." With a light chuckle he took his fingers through his hair wishing he had not decided to cut it this past month. He had always had it long and it was easier to put his hand through, but he was getting older and thought it was a better fit. Laughter was the reaction he had for the quidditch comment and a shake of the head, "No, I'm not really. I mean I had friends that played and I can follow it easy enough, but was never interested in playing myself. Music is more of my thing. Maybe you'd heard of the band I'm a part of, WereWolf Snout" It had been around for years now and they had a few number ones in their prime and more recently when Natalia had joined. Though she was now doing more writing than singing for them. "Are you ready to go in and give this a go then?" Or maybe just ditch the date and head to the leaky for a drink he thought as he opened the door and held it for his date. The 39 year-old couldn't help but chuckled at that statement. "No, you did not disappoint me at all." In fact he didn't expect much from this date and just wanted to have a good time with anybody who became his date. Somehow his face seemed a little bit familiar for Jordan, perhaps they had seen each other before today but he didn't exactly remember when and where. Excuse him, his memory was a little bit foggy. So he was a musician, Werewolf Snout... Oh, he must've been at Gaston's wedding a few years ago then. That's why Ed's face seemed a bit familiar for him. "Yeah, I've heard of that. I think my former co-worker used to be a part of your band... Marchand? Gaston Marchand." They used to work together as Hogwarts professor and Jordan used to love teasing him. Ah, that lucky hopeless romantic guy. "Let's just find out first what they had prepared for us." Hopefully it would be fun. Brad thought it was a nice idea to set up a special place for two to get better acquainted. What better place than in the shop holding the many beloved sporting equipment and items. Easy conversations if anything, especially during this time of the year. After adjusting the room in the back so it looked just right he went on to the front. Aha, the two dates were already here and seemed to be getting along nicely. Brad smiled at the two, "Evening gentlemen, your date begins this way." He gave them some time to at least gaze upon the sight before he walked over towards the back room. Staying at the entrance so they could get another moment to take in everything. "I believe you both will find enough here to keep entertained." Acknowledging the levitated note in the middle. "If you need anything else, I'll be up front." They were guaranteed enough privacy and freedom to try everything out now.